A tree is a basic sundial. Notice how the shadow cast by the tree changes position during the day. Sundials are just fancy things that cast shadows like a tree onto a clock face. Notice the "clockwise" direction the shadow moves throughout the day corresponds to the "clockwise" direction the hands on a clock move. This is why clocks go clockwise. Also note that at mid-day the shadow points directly North, and mechanical clocks point straight up signifying high noon. This is why all dials of any type usually go clockwise. 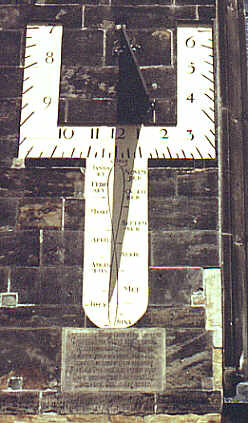 Shadows go "clockwise" only for people in the northern hemisphere. In the southern hemisphere everything is reversed; the shadows go counter clockwise. Here is a sundial made for the shouthern hemisphere. 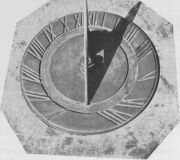 Most of Earth's land is in the northern hemisphere, so it's not surprising that the people who invented clocks and dials and made them go clockwise lived in the northern hemisphere where sundials and tree shadows go clockwise. Here's a brain teaser for you to think about: What direction do shadows go for someone living on the equator?